Medicinal blend of exotic essential oils mixed with fatty oils. Apply vigorously into the skin 2-3 times daily or as needed. For arthritic pain, apply Pain Management Formula onto the affected area as specified. Follow by vigorously applying Rubutin onto the same areas. Cover feet with white socks and hands with white cotton gloves. Relax for 30 minutes and then remove socks and gloves. Rubutin works to seal in the therapeutic effects of my Pain Management Formula, thereby optimizing the results. 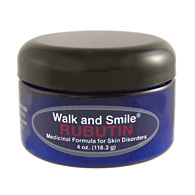 For Athlete’s Foot or any other skin condition that requires my Antiseptic Formula: After applying Antiseptic Formula, apply Rubutin directly onto the same areas to treat and prevent skin conditions. Rubutin also eliminates foot odor. Having recently completed an intensive series of clinical trials with a diverse group of patients, I am now prepared to market Rubutin to the public. Its primary indication is medicinal, acting to protect the skin from a series of painful and adverse conditions, including any dermatological disorder not healed by those typically prescribed steroid creams. 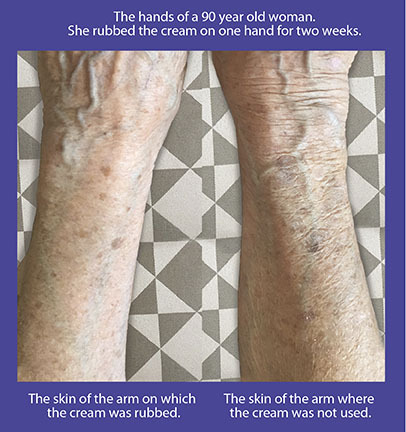 Quick and easy to apply, Rubutin is your first line of defense against dry skin, Athlete’s Foot, dermatitis, eczema, psoriasis, seborrhea, bedsores, paper-like skin, diabetic and trophic skin disorders, scars, stretch marks, arthritic skin changes, edema, aching feet and foot odor, among others. In addition, after a short time, most patients report a noticeable difference in their skin’s appearance: the disappearance of fine lines and wrinkles, deeper wrinkles becoming less noticeable, and no more morning puffiness! Rubutin’s proprietary formula essentially ends the skin’s tendency to expand and contract that is the cause of most wrinkles. Its continued use will rejuvenate your overall look naturally without plastic surgery or chemical injections. As a skin regenerative product, Rubutin also works to eliminate unsightly heel fissures after only a few applications. Your feet will both look and feel young again so you may wear those sandals without fear! Rubutin... a one-step cream for a multitude of problems!